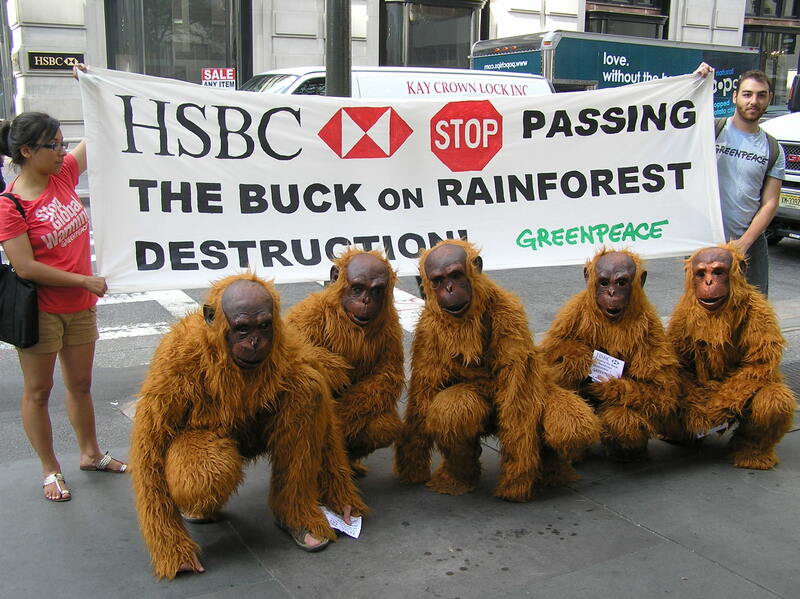 Greenpeace orangutan activists protest HSBC involvement in destroying the rain forest and it's inhabitants in Indonesia. A funny thing happened to me on the way to the office this morning. A bunch of orangutans informed me that the UK bank HSBC (one of the world’s largest financial institutions) might be helping an Indonesian palm oil manufacturer deforest large sections of the Indonesian rain forest and add several tons of green house gas CO2 to the atmosphere. And, according to Greenpeace, by investing in deforestation HSBC is pushing endangered species like the orangutan and Sumatran tigers to the brink of extinction. That’s a lot to take in before my first cup of coffee. According to a Greenpeace website blog HSBC positions itself as an environmentally responsible bank. Their policy is not to invest in companies that destroy rain forests and they offer mutual fund that invests in companies offering climate solutions. This all sounds pretty good. But here’s where it get’s tricky. HSBC has a fund called the Global Climate Change Fund and one of its holdings is Sinar Mas, Indonesia’s biggest palm oil producer. The Sinars Mars company is part of the Global Climate Change Fund portfolio because they are looking to turn palm oil into a climate-friendly, low-carbon, biodiesel. This still sounds sort of good. Here’s the problem, Sinars Mars seems to be destroying Paradise rainforests and carbon-rich peatlands to make room for its palm oil plantations, often breaking industry standards and Indonesia law in the process. HSBC has an ethical forestry policy, which means they won’t ” finance plantation converted from natural forest since June 2004.” The loophole is that this rule currently does not apply to its asset management funds. I’m confused. Isn’t having a company in one of your funds the same as investing? So what does this mean to the world? According to a January report by Renewable Fuels Agency, the UK government’s biofuels regulator, wiping out rainforest to make palm oil fuel doesn’t really help the environment at all. In fact it does a lot of harm. In fact, the article in the Guardian quoted the report, stating: “If palm oil expansion causes loss of natural forest, the carbon release associated will negate any potential carbon savings from the use of palm biodiesel.” The land use change emissions from deforestation would take “130 years to repay” in carbon benefits from palm oil biodiesel, and the “carbon payback for biodiesel feedstock produced on peatland can be measured in millennia”. Its hard not to get a little depressed when a government agency is talking about damage that will take hundreds to millions of years to repair. Or when Greenpeace tells me more animals are endangered, basically by corporate greed. And even worse, if it weren’t for those activists in Monkey suits this morning, I’d probably have never known. Sign this Greenpeace petition and tell HSBC that their corporate loophole isn’t going to fly. Tell them to have the courage of their convictions by pulling their financial support from Sinar Mas and their illegal, unethical deforestation practices. Saturday. Fire Island. It was a glorious beach day. We took the 6:30 ferry home from Watch Hill. As we chugged across the bay, I wasn’t enjoying the sun on the bay, I was staring at John’s iPhone searching for a place to have dinner. There’s an Italian restaurant that does homemade pizza near the highway that we had as a fall back. The kids love it. The food is decent. But I wanted to try to eat local. I knew there was a site that listed restaurants that served local eats but I couldn’t remember it. So I went to Michael Pollan’s page and looked under the resources. I felt a bit like a groupie, but it worked. Eating Well is an amazing resource. It would have been even more amazing if I had checked it before we left the house. I needed someplace close, that served local, and that was kid friendly. I did come up with a list, I didn’t have good enough internet service to scroll through the choices. The places I did see looked beautiful, but probably too nice to bring two beach-sandy kids. Flo’s Lunchonette was the quintessential all-American family restaurant. It was certainly local, but what they meant by local eats, was not what I meant. In fact, culinary it was about as opposite from what I was going for as you can get.I had sort of resigned myself to that when I agreed. I knew it would be burger like substances and fried food. And it was. In its defense, it was lovely. A half a block from the beach, the little family joint was nestled on the edge of sleepy, neighborhood beautifully saturated with color — the lawns were intensely green and the gardens and flowers so bright they felt tropical. It reminded me of Pixar interpretation of Long Island bedroom community. The kids were happy with their hot dogs and hamburgers. And in a moment of nostalgic weakness I let them order root beer floats. I let it go that they came in plastic cups with those big plastic domes on top. The advertised homemade Manhattan clam chowder. I love Manhattan clam chowder — I thought it would be an ok choice. But when I looked to the displayed bowl sizes, the small, medium and large “bowls” were styrofoam. The teenager taking my order shook his head. “No bowls in the back. The ones you can wash out?” John asked. I didn’t order the clam chowder because it came in styrofoam. It was the least I could do. Instead I ordered a plate of steamed clams which they assured me came on paper. 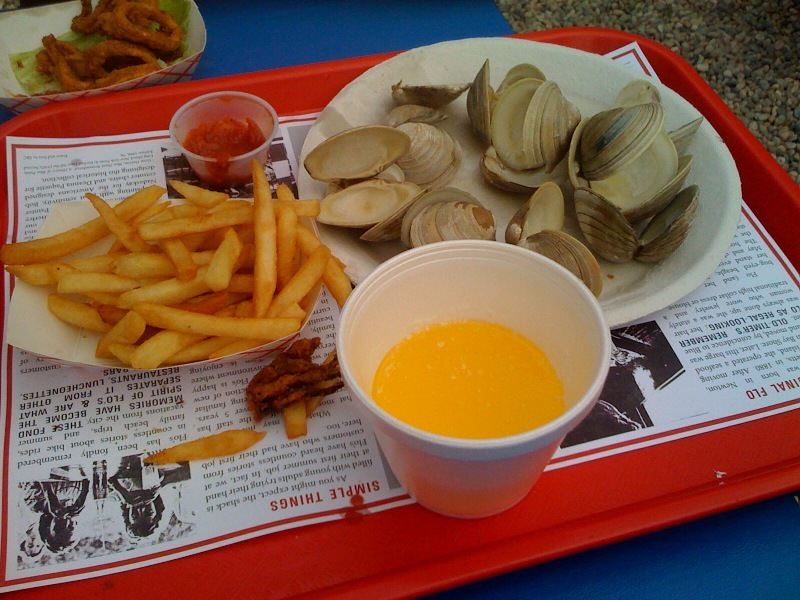 When I picked up the order, I asked for a little butter to dip the clams in. Sure, they said, we can do that. When they called me back, they handed me a medium styrofoam soup bowl half filled with melted butter. There was nothing I could do, I took it. None of the food was particularly good. My order had that food like substance taste that sort of tastes like food, but sort of doesn’t. Even the French Fries lacked flavor. In a place like Flo’s, they are too entrenched in using disposable to expect that I would be able to not make environmentally impactful trash. I mean, disposable dishes as part of its business model. In retrospect, when I saw that people were taking trays of take out food, I should have turned around and left. Next time I don’t have the courage of my convictions, I’ll simply conjure up an image of my big bucket of butter. We are babysitting worms for the summer. Well, not just worms, a whole ecosystem including other creepy crawly things like rolly pollies that live in the Can o Worms composting bin that has been relocated from Zane’s classroom to our kitchen. We had a worm bin about 3 years ago. It wasn’t half as fancy as the Can o Worms luxury high-rise. It was a simple plastic box which I got after taking a class on Vermiculture composting at the Inwood Hill Park Nature Center. The point of the worm bin is vermiculture composting, which is a way of using various species of worms, usually red wigglers, white worms, and earthworms to turn non-meat kitchen scraps into waste. Zane’s class has it to help study ecosystems and recycling. I had it because I wanted to create less garbage. How do worm bins work? Well, the worms eat the raw kitchen scraps and poop out a nutrient rich organic matter that can be added to soil to help plants grow. And the little critters are pretty efficient. Apparently, one pound of red worms can turn half a pound of food waste into garden-ready compost every day. Will it work? I hope so. My last ecosystem was not super successful. l was ambitious and tried to compost everything — from Christmas tree branches to banana peels. My compost got too moist and the worms tried to evacuate making a mass exodus up the sides of the bins. As they were leaving, the flies moved in. I’m hoping that this compost bin, with its multiple layers will be easier to maintain. For one thing it has a spigot which will let me better regulate the moisture but letting me drain “the worm tea” a super rich liquid that can be produced while the worms are composting. I recently read that worm tea is not only a great organic plant food, but it’s also a natural repellent for aphids, spider mites, scale and white flies. My houseplants can get plagued by aphids, so I’m eager to see if the worm tea really does the trick. Why bother? Well, food scraps are organic matter. The kind of bacteria that can decompose the organic matter in the landfill gives off methane gas as a byproduct. If the methane is not vented properly it can explode or catch fire. When the methane gas is properly vented it’s a greenhouse gas that contributes to global warming. While this isn’t the worst contributor to global warming, the bigger issue is that by keeping organic matter out of the landfills, you both decrease the quantity in the garbage pile and you also create a usable substance — compost. Isn’t that’s reason enough to have a party. Yoga at the great lawn didn’t happen after all. I went with my friend Alyssa to take the first breath of summer with several thousand other yogaphiles. Instead, we fidgeted on line for almost two hours while the sky grew cloudier and the raindrops started. There were definitely 10,000 people. It was quite a site to see the park filled with so many yoga enthusiasts — men and woman, young and older. I didn’t mind that we never made it to the lawn — I loved having an excuse to be in the park. I only left when the officials finally kicked us out because of thunder-storm warnings. I never received my free yoga mat or chic bag which had low-carbon snacks including a delicious looking brownie from Otarian made with local and sustainable ingredients. Otarian’s tagline is “It’s time to make sustainability part of how you eat.” Hmm. I like the “part of” part — makes it seem doable. The only thing they gave me was a bottle of water — which of course I couldn’t take — and a few pack of – fruit which despite their shiny silver pouches, I took for the kid. On my way out I saw stacks of empty cartons that were left over from the free yoga mat giveaway and piles and piles of the paper Otarian boxes. I certainly hope they gathered them and recycle all that paper and cardboard. I would be a shame if it all ends in the trash. And I’m trying not to think about the 10,000 plastic bottles garbage generated in the name of downward facing dog. He was right. There were lots of boxes within boxes. I’d like to think he was becoming aware of packaging and waste, but I really think he wanted to make the irony of it all really clear. Blaise has been happily making seltzer. The starter kit came with a box soda flavor pack. The kids were excited but I don’t want to use it. I don’t want to encourage any behavior that brings them closer to feeling that a can or coke or Pepsi is a normal everyday thing. We’ll see how long my resolve lasts. Meanwhile, it’s hot and steamy despite the rain — summer is officially here. A lot of my posts at the beginning were about how embarrassed I felt that I didn’t know more about sustainable eating or eco-friendly living. John has been saying all along that nobody is doing it perfectly. I’m starting to see that he’s right. Saturday morning, I was on line to buy apples at the usual farm stand when I spotted potatoes. I normally potatoes from another farmer but they were right there. “I don’t know. I hope not,” the woman on line behind me said. “Why don’t they put up signs. I feel like an idiot walking around the market asking ‘is that organic?’ over again. What do you do about batteries? Sunday morning, last baseball game of the season. A friend came up to me. I didn’t have an answer for that, so I went to my friend Earth 911. Apparently, Staples, Best Buy and Radio Schack all recycle both s and rechargeable batteries including Nickle Cadmium batteries. NYC recycling centers will also take the rechargeable batteries along with all those new light bulb that contain mercury. The Aveda program looks like it might be a caps for charity type of thing. I need to do more research — tomorrow! Beef. It’s what’s for dinner. Once in a while. A 22$ steak feels expensive. But a $32 take out chinese food meal feels cheap. Last night I spent $22 on a London Broil for dinner. My plan was to go to Whole Foods on my way home from work but I couldn’t get out of work in time. So I went to Grand Central Market, the pricey and lovely little foodie aisle in Grand Central. Ceriello Fine Foods had grass-fed beef. As the counter guy wrapped up the meat (in paper, of course) I asked where the meat came from. The guy thought I was asking about what part of the cow it came from. He stared back at me, trying to puzzle out what I was talking about. Then he called to his buddy in the back. “In the Midwest,” he said when he returned. Damn. I thought, and in my mind I literally saw smoke pouring out of the tailpipe of a refrigerated truck in an ugly black cloud. But as I started to walk away I thought it over. For starters, it was grass-fed which meant it was healthier for my kids –According to Jo Robinson of Eat Wild, grass-fed beef has less total fat, saturated fat, cholesterol, and calories and more vitamin E, beta-carotene, and vitamin C. Not to mention the health-promoting fats, including omega-3 fatty acids and conjugated linoleic acid. Ok, my grass-fed steak wasn’t local, but the Chinese food I was going to have to order in instead wasn’t going to be anything but easy. And I’ve already blogged about the waste of take out. So I called the butcher back and took the steak home. I did have to look the other way while he swiped my credit card. It just felt like a lot of money to be paying for a steak. And compared to the $1.99 feedlot London Broil I can get on sale at the supermarket, it is. On the other hand if I had ordered in Chinese food, it would have cost more. And I would have felt like I’d had a relatively cheap meal. When you look at the numbers, it makes no sense. True, I had to cook the steak, but cooking steak is one of the easiest things you can do. And I have to say, it was much tastier than the last grass-fed steak we’d had, which I’d bought at Whole Foods. My little caveat is this — we don’t actually eat red meat very often. The kids don’t like lamb. And I stopped buying bacon, our only pork purchase, after reading Michal Polan’s description of how pigs in feed lots bite off each others tails in a desperate attempt to suckle. Zane, our biggest carnivore, sometimes gets a grass-fed hamburger instead of rice and beans. 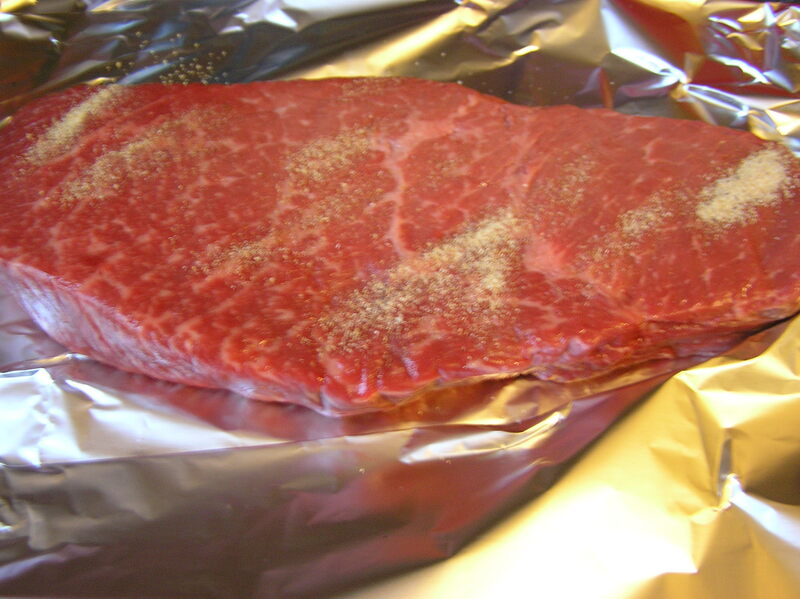 I’d like to cut red meat completely out of our diet — it’s been on my to-do list for a while. Today’s family breakfast at Zane’s school ended with twenty some odd 2nd- and 3rd-graders singing Michael Jackson’s Man in the Mirror. The tears really kicked in when all those kids started to sing. Even though a lot of the time I struggle between feeling foolish for trying to implement eco-conscious restrictions on our buying habits, hearing all those little voices singing strengthened my resolve. The teacher asked the kids what the song was about they said, “Being good to the earth.”and “Stopping the oil spill.” and “Being good to people.” The words of course were right on. People clearly want to do the right thing. But as I looked around the room at the piles of garbage, I couldn’t help but worry. A lot of times, my home-baked goods get passed by — the kids are bedazzled by the Dunkin’ Donuts, the store-bought bagels and muffins which, this time, were festively bright and yellow. I helped a harried mom wearing a nurse’s scrubs unpack plastic box after plastic box of these gleaming muffins. The dozen left us with three big packs of plastic. She, like me, wants to be a good mom and make her kids proud. I saw the worry in her eyes: What time was it? Would she be late for work? How soon could she duck out without her daughter feeling neglected. I knew what she was thinking — I was thinking the same thing. Sometimes it’s all too clear that there’s a big gap between knowing what’s eco-friendly to living it. Sure, everybody believe what Michael Jackson sang about, everybody wants to the right thing, We want to look in the mirror, but half the time we don’t know what we’re looking for. The other half of the time we don’t have the emotional energy or the financial where-with-all to make the most eco-friendly choices. I’m not judging anyone. But I wish there were a way to start a bigger conversation, to encourage more people to make those little choices everyone talks about all the time. Like not to use plastic bags at the grocery store or to think about how much garbage what they want will create. There are so many of us, if we all just made a few of those little changes it would make a big difference. I thought about how the man at the recycling booth at the Inwood Farmer’s Market said most people don’t recycle what they can in the current city programs. I thought about how many times since I started this year of thinking sustainable, I’ve wanted to drop it all and just buy a bottle of water. I’m not saying that we should all go cold turkey and quit consumer convenient foods — but there are certainly times when a little bit of thought and planning and resolve could make a difference. Of course, it’s hard to keep it up. Tonight, I bought the kids two boxes of individually wrapped ice cream pops even though we’ve had numerous discussions about how that kind of ice cream makes lots of garbage. I gave in on the ice cream because like the mom at the breakfast, I wanted to create a moment that my kids would enjoy. My mother used to buy me those kinds of ice cream pops after she picked me up from school. For me in that moment, the tug of nostalgia was stronger than the pull of living green. They both nodded, put the Popsicle sticks in our reusable bag so that they could be recycled at home. They looked like they got it. One can only hope.